This thread is for all of your NFL 2017-2018 season discussion. There is no other way to start this thread. Everything else for Tom Brady is just gravy. that 4th quarter passing (and catching) was truly great. especially under the pressure. as unbelievable of a come back as that was - you know, when you have a guy like Brady at the helm, anything is possible. I'm sure his teammates believed the whole time. brady has got something strong within his soul that most people will never even get a glimpse of or even understand. dude is a true fighter and football player. but yeah, the falcons choked, too. ATL's defense got super cocky and MrGOAT crushed them. Over 50% of those second half passes were unreal. Two hard hits on Ryan and he was also crapping his pants. 4 targets to Julio? Too scurred to wait for the routes to finish. That throw at 18:33 was amazing. How many QBs in NFL history do you trust to make that throw in overtime of the superbowl? 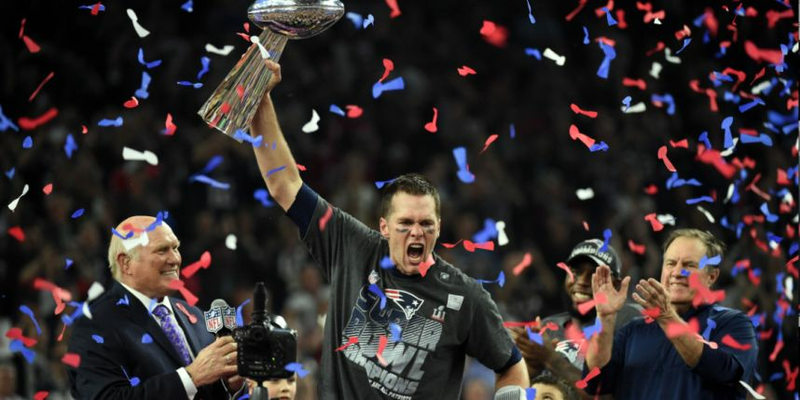 I HATE N.E.....but this was one of the greatest Superbowls of all time...with the greatest comeback of all time...with maybe the greatest quarterback of all time. 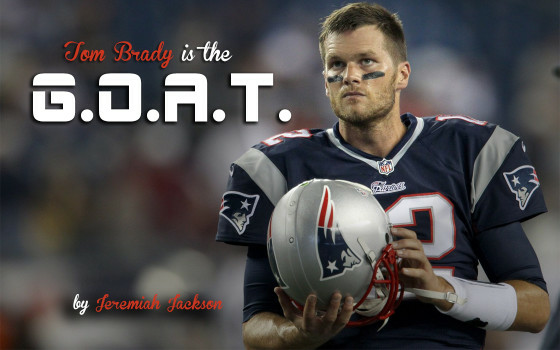 Brady showed his haters how ya put a stamp on that b!tch. I dont know if earl thomas doesnt recover from that injury then sea is gonna have a real hard time making it. Their defense looked real bad without him. perennial all-pro NFL safeties are quite rare and difficult to replace/compensate for. I still can't believe the stupid falcons. I'll quote a friend of mine, "How about those Falcons last night? I'd call that the biggest bed-shitting in the history of sports." Not the best quality, but a good time anyways - despite standing in sleet for 3 hours. 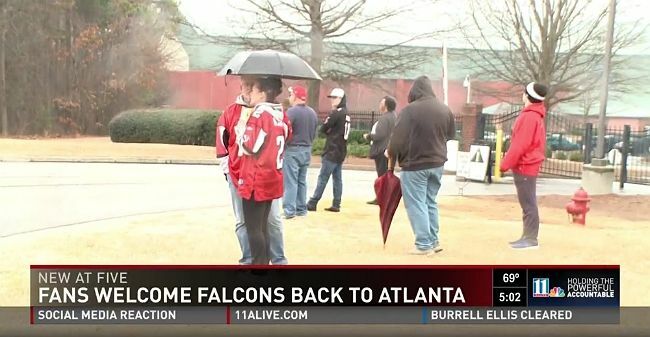 bodom - It was a rough, moist 3 hours waiting for the ATL buses to bring the beloved Falcons boys home from the big game. But the huge crowd, seen below, had a great time cheering their NFL 2nd-place march of shame. LOL to Kyle Shanahan being HC and OC in his first year as a HC for the 49ers. Sorry, Bruddog, but your 49ers are screwed for years to come. This is like the reverse Mike Singeltary years all over again. Good news: Mike Singeltary made the team that Jim Harbough took to the super Bowl. Maybe that happens again? Regardless, 49ers are looking at 3+ years before they find relevance again. Shanahan >>>>> singletary. I knew what plays were coming when singletary coached. That said the exodus/lack of talent means we are definitely years away. That's that's what I mean be reverse Singletary. I feel like Shanahan is going to build an offense that's competitive, and eventually get replaced by a defense-minded coach who will use Shanahan's created offense to get the team over the hump. Brutal. In terms of player talent only, I don't know what franchise has it worst for next year--Browns or 49ers. Though, I still would bet any day of the year on the 49ers getting their act together long before he Browns ever do. myself having a little bit of respect for the 49ers and their historical significance to the NFL, I just hope that the 49ers can get back to playing football instead of being a traveling political clown show. It's never been the same in San Francisco since they lost Eddie DeBartolo as the owner. The York parents don't care to be involved and their brat kid is just playing NFL owner. Hopefully the new coach and GM can rise above it. It's going to be a long climb though, the roster is so depleted.